UK dealers buying foreign silver, overseas bidders taking British work and generally solid interest for traditional pieces of mid-ranking silver brightened up the normally quieter late summer sales across the country. Material from abroad formed a substantial part of the success at Mallams’ (20% buyer’s premium) specialist sale at Oxford on August 27 but it was a quintessentially English piece which led the day: a George I ale jug. Standing 8in (19.5cm) tall and weighing 28.5oz, the baluster-form vessel with scroll handle was marked for John Gorsuch, London 1726 and was engraved with a crest. It sold to a UK collector at £5400 against a £2000-3000 estimate. The Netherlands, Germany and China provided three of the better sellers. A 17th century beaker was marked for Friesland with the date letter B, probably referring to 1674 or 1696. Standing 4½in (11.5cm) high, it was period engraved with handsome reserves of figures and scrolling foliage borders and a presentation inscription added in the 19th century. It sold to the London trade at a double-top-estimate £3000. A London silver dealer also beat Chinese interest for a late 19th century tea service by Wang Ling. The three hexagonal-section pieces with simulated bamboo handles were repoussé decorated with panels of figures, dragons and flowering foliage and came in a fitted hardwood case. It doubled the mid-estimate at £3600. Germany was represented by an early 20th century Hanau nef stamped with the marks of Berthold Mueller. The 21in (54cm) high, 79oz three-mast ship with removable top section was repoussé decorated with Neptune and featured figures and cannon on the deck. It sold at £3800 against a £1800-2500 estimate. 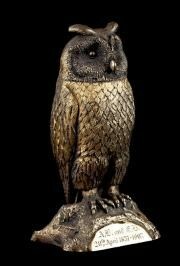 Given the current prices collectors are prepared to pay for novelty silver scent bottles, an Edwardian silver-gilt example modelled as an owl – a popular subject in any medium – was always likely to be a private buy. The 5in (12.5cm) bottle was marked for Goldsmiths & Silversmiths, London 1906, and estimated at £300-400. It duly went to a collector at £3200. George I beer tankard – £5500 at John Nicholson’s. 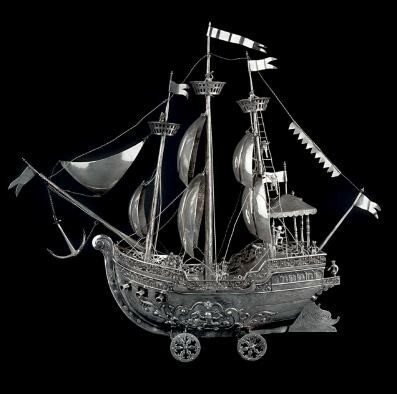 US buyers took the two best pieces of silver offered at John Nicholson’s (24% buyer’s premium) in Haslemere on August 29. One was a 22oz George I beer jug by Bowen and Nash (London 1725). It was engraved with a coat of arms featuring three Welsh dragons and a mermaid and the motto Heb Dyw – Heb Dim – Duw A Digon which translates roughly as Without God, Without Anything. God Is Enough. While wine is strongly associated with Christian worship, the link between God and beer is less common. Possibly the American on the phone knew of the quote attributed to his compatriot Benjamin Franklin, ‘Beer is proof that God loves us and wants us to be happy’, when he went above estimate to buy it at £5500. The other US buy was also wine-related – a Victorian ‘Cellini-pattern’ embossed wine ewer. Standing 11in (28cm) tall, the London 1863 piece with the maker’s mark GA went one comfortably above estimate at £1100. Queen Anne thistle cup – £4600 at Thomson Roddick. Early Scottish silver was among the prized lots at the August 9 Edinburgh sale held by Thomson Roddick (17.5% buyer’s premium). A 3in (8cm) tall Queen Anne thistle cup tripled expectations. Initialled WDMP, it bore Glasgow hallmarks, a date letter and the maker’s marks IL (for John Luke) twice. Pitched at £1000-1500, it sold to an internet bidder via thesaleroom.com at £4600. Going similarly over hopes was a 4¼in (11cm) wide quaich engraved DMK 1783 to one of the handles and marked to the base INS. Made by the Inverness silversmith Thomas Borthwick (1750-c.94), the quaich had some problems but was otherwise in good condition and, against a £300-500 estimate, it took £1600 from a Scottish private collector in the room. 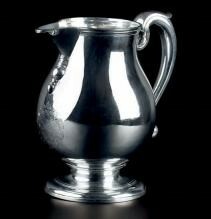 Any silver that can be catalogued as ‘of Jacobite interest’ is guaranteed to stir romantic hearts. That appellation was given to a set of four mid-18th century cast candlesticks offered at Lyon & Turnbull’s (25% buyer’s premium) sale at Edinburgh on August 15. Standing 8in (20cm) high and weighing 61.5oz, the sticks were linked by family tradition to Judge James Graham of Airth, a doughty supporter of the Stuart cause who defended Jacobites on trial after the failed 1745 rising. However, as the Judge-Admiral of Scotland died in 1753 and the sticks were made by Lothian & Robertson of Edinburgh in 1758 and 1759, the association appeared a shade tenuous. Nevertheless, they almost certainly belonged to the judge’s daughter, Mary, the arms of whose husband, John Stirling of Kippendavie – the crest of a Moor’s head and the motto Gang Forward – were engraved on the sticks. That, and the quality of the workmanship, was good enough for bidders. Against a £6000-9000 estimate, they sold to a collector at £9500. 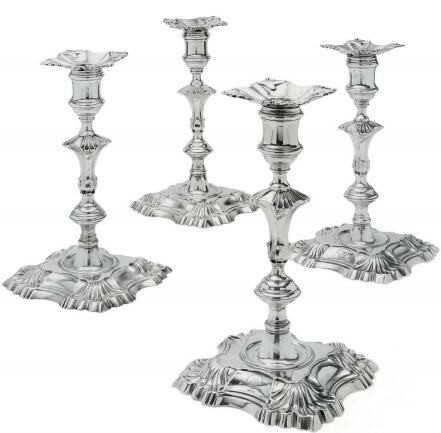 Three of a set of four 1938 candelabra – £20,000 at Bonhams. There were no doubts about the provenance of more than 50 splendid candelabra offered at Bonhams (25% buyer’s premium) in London on July 25. The Georgian revival candelabra were made by Goldsmith & Silversmiths of London in 1938 for the famous Painted Hall in Greenwich, then part of the Royal Naval College, when it was being restored as a dining room. On the market because of another major refurbishment at Christopher Wren’s building, now run by a charitable foundation, the only worry would seem to have been one of over-supply on the market. As it turned out, the candelabra, offered in 16 lots, totalled just shy of £125,000, comfortably above hopes of £100,000. “It was a rare opportunity to acquire an impressive display of candelabra with great provenance, so it was no surprise that there was such strong bidding,” said Bonhams silver expert Miles Harrison. Every lot got away to a mix of trade and private buyers from the UK and abroad. Prices ranged from £3500 for a pair of three-light candelabra to £20,000 for a set of four five-light candelabra.